Yes, it’s 2:35am and I’m blogging. Listen, when the Georgia Bulldogs play like that, I have a hard time going to sleep right afterwards. Give a girl a break. That was a long game. And a glorious one. Though I will tell you, as my girl BooMama said, I felt so sorry for Hawaii all night long. THE STORIES that the commentators told were ridiculous. Player’s mom dying, criminal turned Christian football star, “family” feeling amongst the team, the traditional Hawaiian dance, all of it was too much for my emotions. Except that one Hawaii player that kept taking his helmet off. I liked beating him. And let me tell you what really chaps my hide. Still, right now on ESPN.com, the main photo story from today is stupid USC. I think USC and ESPN are dating. Or someone at USC has some good dirt on someone at ESPN. It’s either a romantic relationship or plain ole blackmail. There is no other explanation. Hey ESPN, 41 to 10. In a BCS game. That’s a serious spanking. Can we get a headline bigger than size 4 font? I have a longstanding issue with ESPN’s treatment of UGA going back to 2002, so you really don’t want to get me started. And Lou Holtz, will you ever like us? I understand, you came from Carolina, but let’s be serious. You’re just being a jerk. You want to know a secret? We don’t like you either. Here’s my favorite moment of the night. I love our boys. 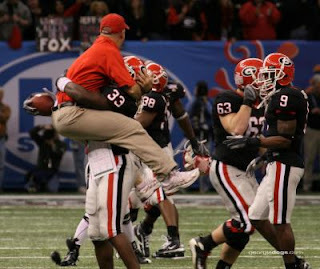 Once more, it’s great to be a Georgia Bulldog. National Champs next year? Don’t be surprised. We’re good. Real good.